Except in cases of emergency, appointments are required for surgery, boarding, bathing and medical care. In case of Emergency during normal business hours, please call ahead if possible. Emergency cases shall always receive top priority followed by patients with previously scheduled appointments. Emergency cases shall always receive top priority, which is why occasional appointment delay is inevitable. Please realize that we make a sincere attempt to see each client on time. For the safety of all animals in our care, we require that all vaccinations be up to date. Even though we make every effort to make our patients feel comfortable during visits, they may be a little uneasy about new people, new surroundings and other pets. This is one of the reasons we ask you to restrain your pet. We recommend that animals be placed on a leash or in pet carriers before entering the waiting room. We are also situated right on Highway 1, so transporting your pet into and out of the hospital should also be done with the pet contained so as not to end up with pets in traffic. We charge a $25 handling fee for all checks returned by your bank unpaid. For your protection and that of others, all dogs must be on a leash and properly controlled while in the waiting area or exam rooms. If you have an aggressive dog, please leave your dog in the car and inform staff so that we may clear the waiting room for the safety of the other pets in our facility. All cats must be presented in an appropriate cat carrier or on a leash. If you do not have a carrier, we have cardboard carriers to purchase. For quickest service, please check in at our front desk as soon as you arrive. 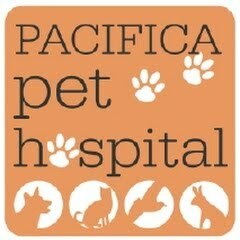 Pacifica Pet Hospital recognizes the importance of protecting the personal privacy of its clients, its patients and those individuals who simply visit our site.